This is a photo of a puppy who was banned from PetSmart because of the way he looks. This is the “vision” for the future PetSmart and PetSmart Charities aspire to. The concerns relating to this troubling, regressive, and anti-animal video are many. 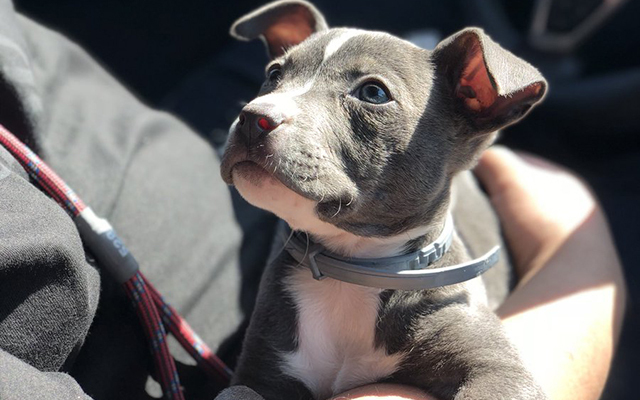 Despite being called “The Future of Animal Welfare,” PetSmart Charities harkens back to the days when killing was central to sheltering, especially of dogs Haston says no one wants and calls “blocky-headed whatevers” (but which most people label “pit bulls”). That PetSmart Charities professes an ugly prejudice against “pit bulls” is unsurprising as its corporate parent, PetSmart, has a discriminatory policy against them, too. But Haston does not admit to prejudice. Instead, Haston claims he is merely following the data and other evidence. To make his case, however, he ignores the evidence and cites a failing pound in a large city that kills more dogs labeled “pit bulls” than it adopts out, a logical fallacy known as backward reasoning and one based on cherry-picked evidence. In other words, he implies that because the chosen pound in question kills large numbers of “pit bulls,” “pit bulls” require killing. PETSMART CHARITIES CLAIM: Shelters can’t adopt their way out of killing. PETSMART CHARITIES CLAIM: Shelters are filled with animals of the kind people don’t want. WHY THIS IS WRONG: I’m going to put aside the obvious problems associated with visual identification of breeds and all the studies out there that prove that dogs we label pit bulls often don’t have any American Pit Bull Terrier, American Staffordshire Terrier, or Staffordshire Bull Terrier in them. I’m also going to put aside the studies proving that these breeds aren’t more likely to bite (or bite harder). The main problem with this thinking is that it is contradicted by the facts. PETSMART CHARITIES CLAIM: No Kill is a fate worse than death. PETSMART CHARITIES CLAIM: Sheltering is too expensive. PETSMART CHARITIES CLAIM: The keys to good sheltering is a strategy called Legislation, Education, and Sterilization (L.E.S.). Suffice to say that you can’t create a bridge to the future by digging a trench to the past. It’s MAGA for the sheltering establishment. And like reactionary populism, it is born of the same (mostly generational) fears: the landscape has changed and adherents are losing their exalted place in it. Thankfully, it’s a problem that has a shelf-life at PetSmart because PetSmart itself has a shelf life. The company is expected to go into bankruptcy within the next couple of years due to mismanaging itself to $8 billion in debt, an inability to pay down that debt, and declining income as it fails to effectively compete with both online and other brick and mortar retailers. Clearly, the same ignorance, lack of attention to innovation, and ability to respond to changing mores found in Haston’s regressive video for PetSmart Charities permeates the entire organization and will, in the end, be their undoing. For the regressive views expressed by Haston are the views of an entire generation of shelter directors and animal welfare “professionals” who are being supplanted by a new, animal-loving generation that refuses to buy into their antiquated and kill-oriented approach to “sheltering.” And as the torch is passed to these more passionate and motivated leaders with the goal of making our shelters into the safe havens they can and should be (as I predicted would happen in my book, Redemption), we should view Haston’s video as the last gasp of dinosaurs who built their careers fighting No Kill or using their positions of power not to advance the cause of companion animal protection, but their own, self-serving interests (dinosaurs who are exemplified by Ed Sayres of the ASPCA who is now a shill for puppy mills and Wayne Pacelle of HSUS who resigned in the wake of numerous sexual harassment and assault allegations). And while I do not think it is wise to ignore the threat represented by Haston’s attempts to re-normalize cruel, regressive views (I liken his views to populism for a reason), it is a testament to how far the No Kill movement has come over the last several decades that these views — which revive the very narratives that permeated the deeply dysfunctional “animal welfare” movement when I began my career 25 years ago — now have the ability to shock with their ugliness and their complacency with killing. So in the coming weeks, I am going to do what I always do to face down harmful views that threaten the well-being of animals: I will provide an alternative vision. I am going to use the evidence to show what the future can look like, freed from the shackles of the regressive and cruel “catch and kill” mentality being advanced by PetSmart Charities. It’s an altogether optimistic future: one where every animal will be respected and cherished, and where every individual life will be protected and revered. And it’s a future we can have the moment we decide to embrace it.